My life has been about passion. Passion for the outdoors, art, music, and all of the beautiful things of this world. 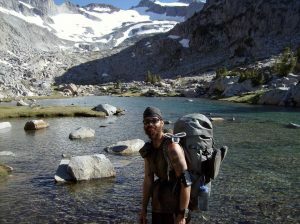 This is my first book and is a true story of my travels on the Pacific Crest Trail. I'm inspired by the idea of inspiring others. That a reader might find encouragement in my adventures to go out and write their own story, maybe not so much in words, but in experiences. Writing this book was an interesting process and happened over the course of 5 years. The initial version I wrote down as I hiked the trail in a trail journal. It was mainly details of the experiences, thoughts, and helped to put everything in chronological order. Years later I revisited that journal and began to write this book. What I found most interesting about writing the book over such an expanse of time, is that I could reflect on my earlier writings and experiences with all the knowledge and understanding I had gained through life and my own personal growth in the years after this epic trip. So in a way I was able to relive the journey, but with the eyes and soul of my future self some 5 years later, giving a natural sense of reflection and insight. The best advice I can give is to write from your heart and stick with it. It took me 5 years to put together a full rough draft, but the rewards and sense of accomplishment when it is finished transcend words. I had a lovely conversation with my friend Deb who recommended I self publish my book. Thank you Deb, it was an amazing way to get my book out there. With the ease of self publishing, I imagine self publishing will become foremost method of reaching readers.